A specific Talisman for safe driving and enjoying happiness and good luck from vehicles is given here. 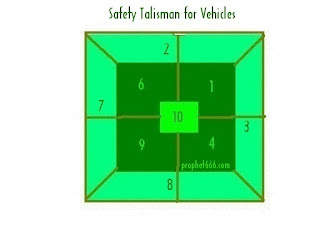 This Talisman known as “Vahan Suraksha Yantra” in Hindi gives safety and protection from the dangers and problems one encounters while travelling and is also said to give benefits and enjoyment from vehicles. Some people are extremely unlucky as far as vehicles like cars or motor bikes are concerned. These people find that something or the other invariably goes wrong while driving, for no fault of theirs; like accidents and breakdowns. These people do not enjoy happiness with vehicles; hence this Talisman is especially for them. This Yantra is to be drawn on a white piece of paper with green ink and kept either in the place of worship at home or in the vehicle itself. sir is yantra me background bi same ayse green kare ya only white piece of paper pe numbers likhe.! 1) Can I use a colour printer to print the above Yantra and keep? 2) Numbers are written with green ink? 3) Also use different shades of green ink for the background like the above picture?